All oils aren’t equal. With so many on the shelves to choose from, which should you use for which kind of cooking? With Australian olive oil growers all but squeezing the last juice out of this year’s crop, now is an excellent time to consume it, since it should be eaten as fresh as possible. I love dipping fresh bread into a good quality extra virgin olive oil but I’m using it a lot for shallow-frying, too. I even used it for deep-frying recently but the price (and reduced health benefits – antioxidants start to disappear when you raise the temperature) are prohibitive when you look at all the other oils available. My interest in oils started with a radical new way of frying chips, gleaned from Nigella Lawson’s Nigellissima series. She cuts fat potato chips, dries them with a tea towel and places them in a pan with cold sunflower oil. She then heats to a rolling boil, stirring occasionally to prevent burning and sticking, adding garlic and other herbs for flavour when they’re nearly done. It was a revelation. My chips turned out great: crisp and brown on the outside with a nice, fluffy interior. But even though she claims the cooking method results in very little oil being absorbed by the potatoes – apparently due to the temperature, rather than the cooking time – I didn’t quite believe it. Plus, the sheer volume of oil I was going through spooked me (there are places you can dispose of your oil, by the way – check with your local council – and never pour it down the sink). But the health question mark continued to niggle. Should I really be feeding this stuff to my kids? 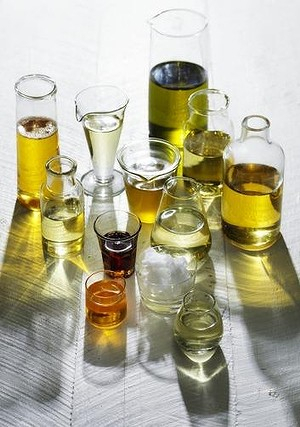 What are the health issues with oils and how do they differ? Even a cursory internet search on this topic can lead you down a rabbit hole of scientific claims and counterclaims. So, with that in mind, I put together a list of common culinary oils, how best to use them in the kitchen and some tips from nutritionists, including author Catherine Saxelby (see foodwatch.com.au) and Associate Professor of Dietetics and Human Nutrition at Latrobe University, Catherine Itsiopoulos. Finally, some scientific help came from Rod Mailer, a research fellow with Charles Sturt University and Chakra Wijesundera, a research fellow with the CSIRO. Thanks also for help from Beth Scholes at the Heart Foundation. Refined oils are more stable and better suited to high-temperature cooking such as deep-frying than unrefined (mechanically pressed such as extra virgin) oils. These oils tend to have higher smoke points, the temperature zone at which the oil starts to break down and give off acrid and sometimes toxic fumes. Smoke points vary in any given oil due to the quality of the oil, its specific terroir and any impurities that might be present. This, coupled with the fact that the longer you heat an oil the lower the smoke point becomes, means re-using oil for cooking is generally a bad idea. The smoke point temperatures in this story are best understood in comparison with each other and serve only as a rough guide. All oils break down over time and become rancid, characterised by an unpleasant odour or flavour. Although eating rancid oil won’t kill you straight away, long-term consumption has been linked to obesity, early aging and cancer. Store all oils in a cool, dark place away from heat (such as your stove) to prolong their life and guard against rancidity. The highest quality olive oil it is made by mechanically pressing olives and applying centrifugal force to separate the oil from water. Extra virgin olive oil (EVOO) must contain no more than 0.8 per cent free fatty acids (virgin olive oil must have less than two per cent). While most Australian EVOO producers adhere to these standards, questions remain about the integrity of some imported brands. EVOO is best consumed within 12 months of harvest and up to six weeks after opening the bottle. Best for? With its vivid colours and rich flavours it’s ideal for salad dressings, eating with bread and drizzling over dishes. But according to research carried out by Cobram, Australia’s largest olive oil supplier, high quality EVOO can reach smoke points at temperatures of between 200-215 degrees , making it a healthy option for most types of cooking, including oven baking. Nutritionist’s tip? Natural antioxidants and vitamins A, D, E and K make this one of the healthiest oils to eat. Research has shown good quality EVOO reduces the risk of heart disease, type 2 diabetes and some cancers. A blend of virgin or extra virgin oil with lampante olive oil (obtained from used olive pulp, which in that state is unfit for human consumption). The blend is then refined, usually by a chemical process that involves bleaching and deodorising. While this makes the oil more stable and neutral in flavour, the process strips most if not all of its natural colour, vitamins, minerals and antioxidants. Often marketed as “pure” or “light” olive oil. Best for? An all-rounder cooking oil, especially for Mediterranean food, suitable for shallow and deep-frying due to its relatively high smoke point. Also good for use in cakes as flavour is relatively neutral. Nutritionist’s tip? High levels of monounsaturated fatty acids make it a generally healthy dietary fat but refinement cancels out many of its stellar health benefits. Buttery-tasting, vivid green avocado oil has a similar fatty profile to olive oil, so it’s high in monounsaturated fats with some saturated and polyunsaturated fats mixed in. Unrefined extra virgin avocado oil is obtained by pressing the pulp and separating the natural oil in a centrifuge. Due to its unusually high smoke point (up to 250 degrees , it’s ideal for high-temperature grilling or pan-roasting but costly at about four times the price of extra virgin olive oil. Best for? Frying vegetables such as brussels sprouts and drizzling over home-made pizzas. Nutritionist’s tip? Antioxidants present can help with eye health and, like EVOO, by drizzling it on your food you can help your body absorb fat-soluble antioxidants present in vegetables, such as beta-carotene. Known for its mildly nutty to gloriously buttery flavour, this specialty oil grown extensively in northern NSW is an excellent addition to sweet or savoury dishes. It’s often advertised as “cold-pressed”, which just means it’s been mechanically extracted in a technique similar to extra virgin olive oil. High in monounsaturates (about 80 per cent), it’s more stable than many other polyunsaturated fats and has a high smoke point of between 210C and 234 degrees. .
Best for? Pan-frying fish, veal and flavouring cakes and slices, and in salad dressings. Nutritionist’s tip? A good oil for heart health because it’s so high in monounsaturated fats, which are known to lower blood cholesterol or LDL (“bad” cholesterol). Extracted from the seeds of sunflowers, it is usually refined, a process that involves the use of chemical solvents such as hexane. While this process makes it more stable and therefore suitable for high-temperature cooking, it does strip out some naturally occurring nutrients. Best use? With a smoke point around 225 degrees, sunflower oil is good for deep-frying dishes such as tempura and chips. Nutritionist’s tip? It’s high in polyunsaturated fats, which have been shown to lower cholesterol, particularly the “bad” LDL cholesterol. The Heart Foundation recommends it as a suitable replacement for butter. Made from one of the oldest oilseed crops around, most sesame oils you’ll find are solvent extracted and refined, although it is possible to buy mechanically extracted Australian sesame oil. Typically, it’s equally high in monounsaturated and polyunsaturated fats (the Heart Foundation recommends you use it to replace saturated fats, such as butter). Best use? Given its strong flavour, it’s best used as an additive, particularly to Asian dishes such as stir-fries. It’s also an excellent addition to marinades and sauces. Nutritionist’s tip? Sesame oil is high in vitamin K, which is great for blood coagulation and bone strength. Similar to macadamia oil with predominantly monounsaturated fats, this fragrant oil, sometimes known as groundnut oil, has a relatively high smoke point at about 230 degrees. Made by pressing peanut kernels, the crude oil has a deep yellow colour, nutty aroma and sweet taste; refined peanut oil is light yellow in colour and neutral in flavour. Best for? Asian cooking, especially stir-fries. Nutritionist’s tip? While refined peanut oil is allergen-free, cold-pressed or crude peanut is not and should be avoided by people susceptible to anaphylaxis. A variant of rapeseed oil, it’s the largest oil crop grown in Australia and is extracted from the canola plant, specially bred in Canada in the 1970s (the name canola is derived from “Canada oil low acid”). Canola oil is light and clear with a neutral flavour; it’s high in monounsaturates, low in saturated fat and has plenty of omega-3s. It’s more stable at high temperatures because it’s refined but then again, the refining process itself raises questions about the healthiness of the oil. In short, a good oil for quick frying but not for drizzling over finished dishes. Best use? You’ll find it already added to foods such as oven-baked chips and frozen fish fillets but with a high smoke point of around 205 degrees canola is a good all-purpose cooking oil. It does become unstable after heating, so never reuse. Nutritionist’s tip? There’s a strong anti-canola movement at the moment but pay no attention. The confusion may stem from the dangerous erucic acid that was present in the old rapeseed plants – modern canola is fine. Also known as linseed oil, it’s a clear to yellow-coloured oil made by pressing the dried, ripe seeds of the flax plant. With a fatty acid profile higher in polyunsaturated fats it’s packed with the highest amount of plant-based omega-3s of all these oils but can develop “off” flavours, so buy in small quantities and store in a cool, dark place, such as the fridge. Tends to be a dietary supplement oil. Best for? Adding to smoothies, yoghurt or bland foods such as quark to enhance flavour. This is not a cooking oil. Nutritionist’s tip? Research says that it’s better to obtain your omega-3s from oily fish and grass-fed meats so, while it’s an interesting oil, it’s not essential. Extracted from the bran and the germ, this neutral-tasting oil has a low viscosity and a relatively high smoke point (around 260 degrees, ) making it ideal for roasting and cooking subtle ingredients, such as seafood. It has an unusual mix of fatty acids – roughly half-and-half monounsaturated and polyunsaturated – and some good plant sterols but it’s industrially processed, not mechanically extracted (or “cold-pressed”, as some people refer to the process where extra virgin olive oil is produced). Best use? High-heat stir-frying or wok-frying. Nutritionist’s tip? Don’t be confused by packaging that talks about being “extra cold-filtered” – it’s got nothing to do with the positive health benefits associated with extra virgin olive oil. Also known as copra oil, this oil is extracted from the meat of matured coconuts. The jury is still out on just how healthy it is (it’s very high in saturated fats at more than 90 per cent) but one thing is clear – stay away from hydrogenated coconut oil, which undergoes a process of extreme heat and pressure and the introduction of hydrogen in the presence of a catalyst (usually a metal) to make the oil more stable and last longer. The process makes the oil more viscous, as it will your blood, making your heart work harder. Virgin or extra virgin coconut oil, on the other hand, is a popular vegan replacement for butter in cooking. Best use? Its natural sweetness makes it ideal for baking and certain sauteed dishes. A low smoke point (about 175 degrees) makes it not great for high-temperature cooking, such as deep-frying. Nutritionist’s tip? It’s a good source of lauric acid, which has been shown to increase HDL or “good” cholesterol levels but there are plenty of kilojoules, so adjust your intake accordingly. Light and neutral-flavoured, cottonseed oil is a major oil in Australia and a byproduct of the cotton-growing industry. It’s relatively inexpensive and high in vitamin E. This highly stable (refined) oil was often used in chip shops for deep frying (you can use it multiple times before the smoke point is compromised) and said to produce a crisp, attractive chip. A mix of predominantly saturated and polyunsaturated fats. Best use? Occasionally for deep-frying. Nutritionist’s tip? With a saturated fat level of about 27 per cent, cottonseed will never get the Heart Foundation tick (20 per cent is the cut-off). This is a stable, refined, plant-based oil but the difficulty is you never really know what it’s made of. In Australia, where a lot of canola oil is produced, your vegetable oil could well be 99 per cent canola – it could also be blended with soybean or sunflower. Usually the cheapest option at the supermarket; check the nutrition label on the back to determine specific levels of saturated, monounsaturated and polyunsaturated fats. Best use? Deep-frying and high-temperature cooking. Nutritionist’s tip? If the saturated fat content is above 20 grams per 100 grams, consider something else. ■ Monounsaturated fats (found in abundance in olive, macadamia and canola oil) are usually liquid at room temperature and are the healthiest fats because they lower “bad LDL-cholesterol” while leaving “good cholesterol” levels the same. ■ Polyunsaturated fats (common in sunflower and cottonseed oil) are also liquid at room temperature but have been found to lower both “bad” and “good” cholesterol. ■ Trans fats are unsaturated fats that have been altered and behave like saturated fats. They can be found in some oils that have been heated during processing and in partially-hydrogenated fats in take-aways and are bad for health because they increase the risk of heart disease and type 2 diabetes. This story, including a recipe interactive featuring all the oils mentioned, was originally published in the Good Food sections of The Age and the Sydney Morning Herald.